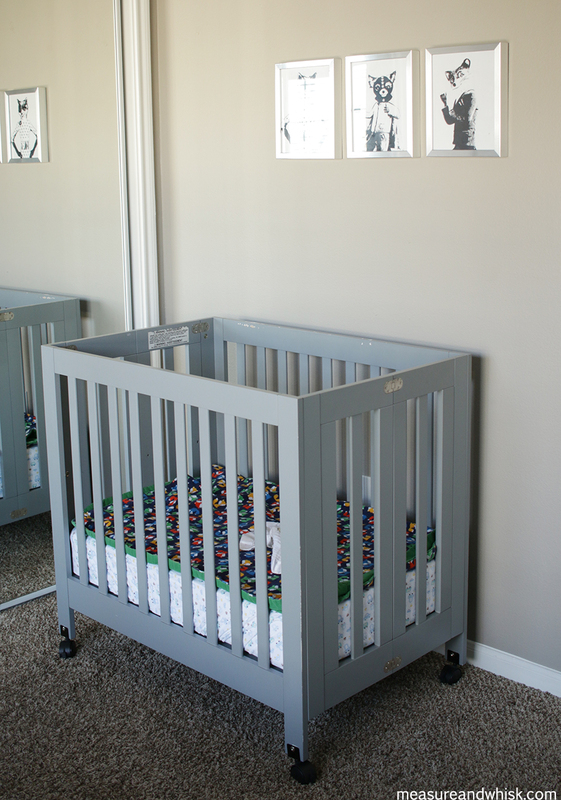 If you have been reading this blog for a few years, you know that Fox didn't have his own room for the first 15 months of his life. 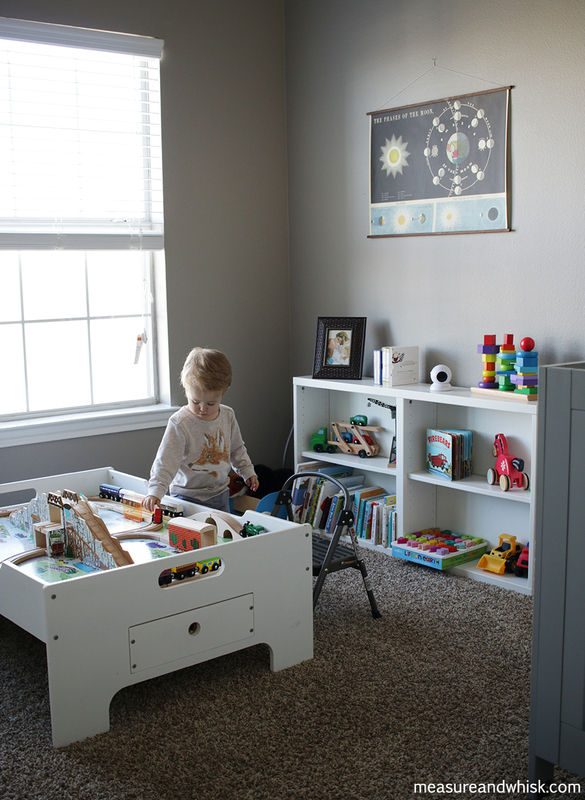 He slept in our closet (see the post about that, here), which worked pretty well, but now that he has his own room, I wanted to show you what we have done with it to make it a good place for a toddler to play, and how I keep his toys organized. He loves playing in his room, and spends lots of time building trains and doing puzzles there sometimes with me, and sometimes by himself. 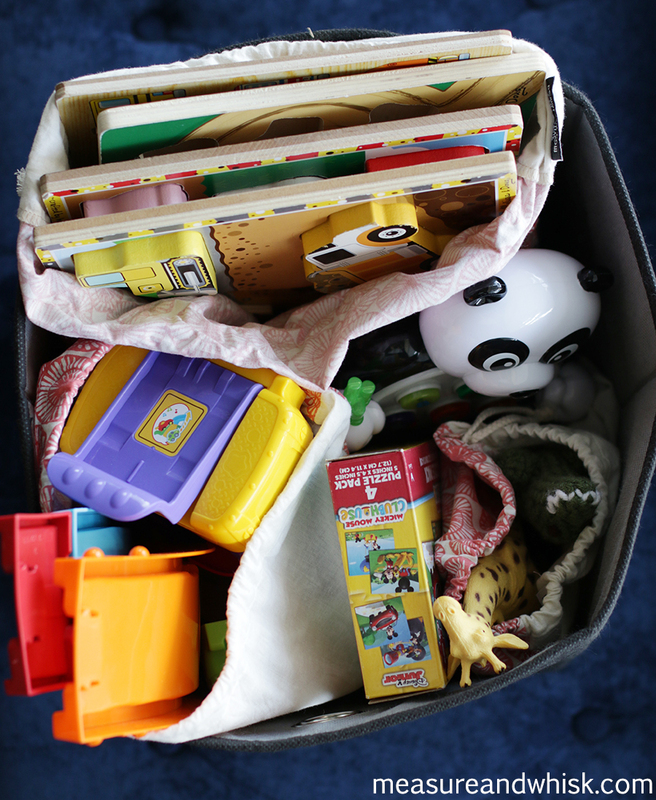 Now, I feel like we have actually ended up with a lot of toys, but because of the way his room and closet are set up, we don't actually have very much storage for them (#apartmentliving), I have devised a not-so-clever system for keeping them all organized. Even if it isn't brilliant, it does work brilliantly. 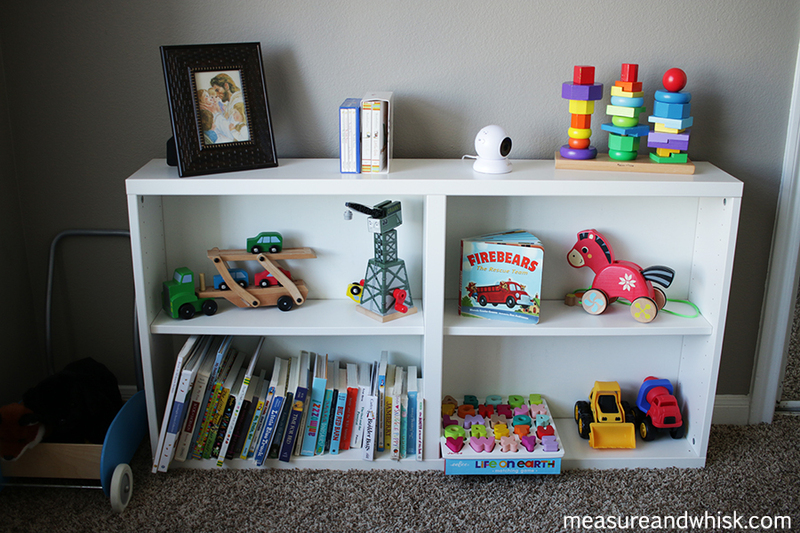 First, we have one little bookshelf that stores the toys he is currently playing with, as well as some books, his video monitor and a photo or two. He typically plays with the toys on this shelf a few times a day. They are all in easy reach, and he is allowed to play with whatever is there. He is old enough that he can get the bigger stuff down with ease, so I am not worried about toys toppling onto his head. 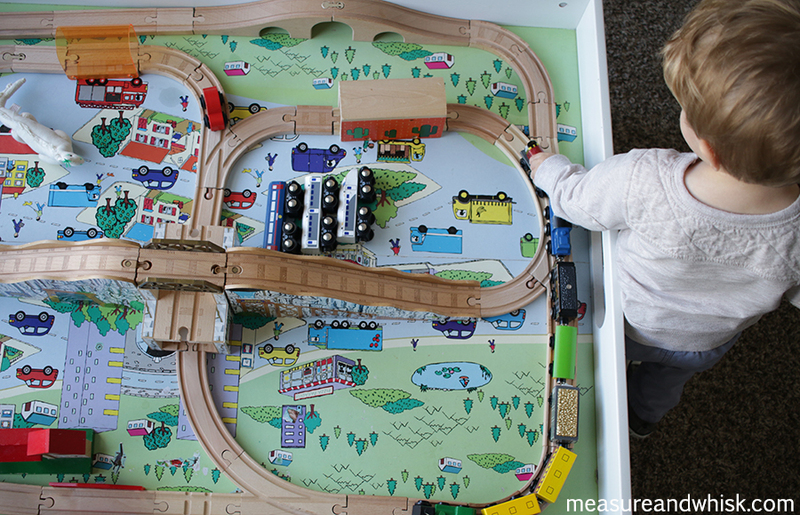 Second, We have a train table , which has two drawers for storing the trains and track. When our friends sold us this table, they also gave us a ton of trains and track, but we already had some trains and track, so some extra track and accessories (like trees and people), are in a box in the closet. 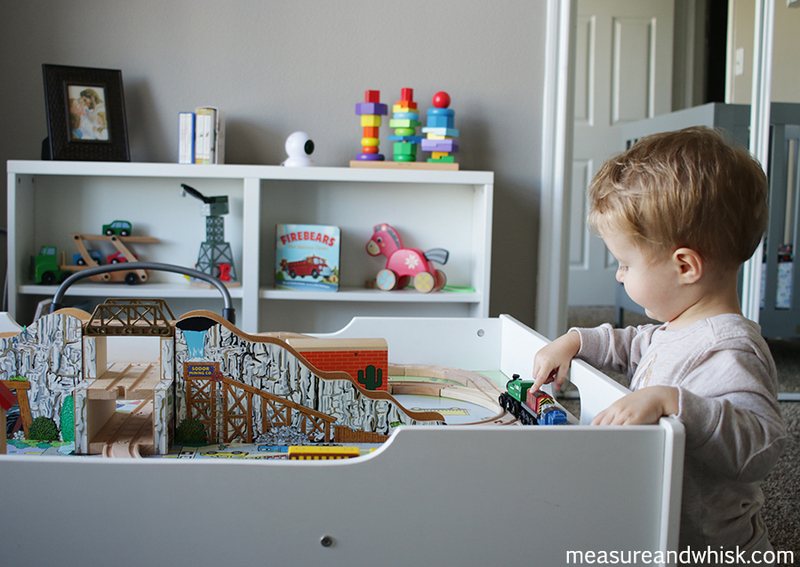 This way, he can access lots of trains and track pieces for building at any time, but there aren't as many pieces to clutter up the room and table. Now, we have more toys than will fit on the shelf, so I have been rotating his toys in and out of his closet regularly. 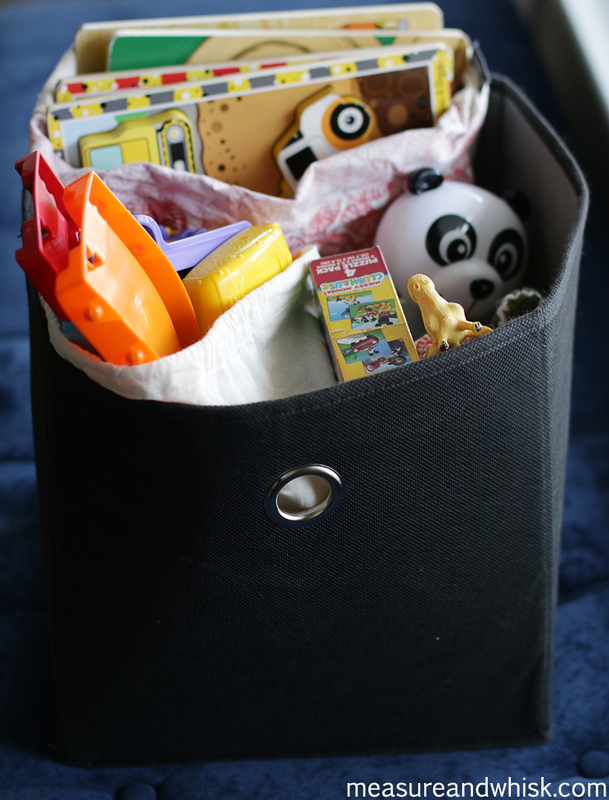 I have some produce bags that I made a few years ago (I used to sell them in my Etsy Shop), and they are the perfect size to keep toys in (I made them 3 different sizes). I collect all the pieces to a particular toy (think puzzle, little people set, or whatever) and then store them in a bag, in a black bin (you could also use a cardboard box) at the top of the closet, and when he needs some new toys to play with, I get them down, and switch them out for something else to store for a few months. So simple, but it works great, and keeps me from feeling like I have to buy Fox new toys all the time. I think the key is making sure your kids can't see the toys, and putting them high enough that they can't reach them either. Then when you pull them out, it will be thrilling for them, and thrilling for you to be able to give them 'new' toys that you didn't have to buy. Oh my goodness! He is so sweet! That video is so cute! And he's talking so well. Mommy, daddy, and Jesus. What more could a little boy need? I'm pregnant with my first (also a boy, also going to sleep in our closet in that babyletto crib! ), so I love all you archives on minimalism and baby! Thank you! This is a great little room! what is the paint color on the wall? such a cute space for him!